Installation of my multi-zone WiFi LED Lighting project is now complete. Taking the low cost approach has had some drawbacks, but I’m pleased with the overall result. 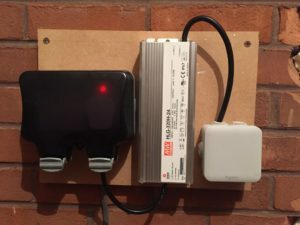 If you didn’t read my previous posts (part 1, part 2a and part 2b) the objective was to setup a cheap multi-zone LED lighting system, with WiFi Controllers which would be integrated into my existing home automation system built upon Home Assistant in order to provide perimeter lighting in a bedroom. The full integration into Home Assistant is nearly complete, that will be captured in a future post. Being able to cut strips every 10cm may sound fairly flexible, but when dealing with rooms whose dimensions are not multiples of 10cm gives rise to some challenges. 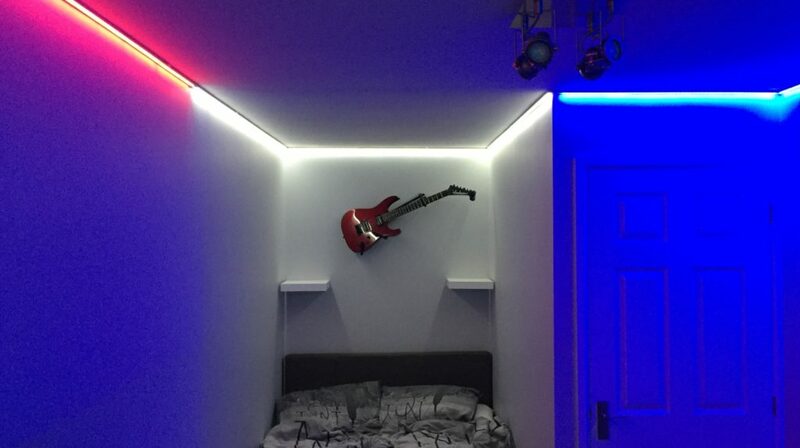 Cheap eBay LED strips, are cheap for a reason. But, still effective. Corners are more difficult that expected. 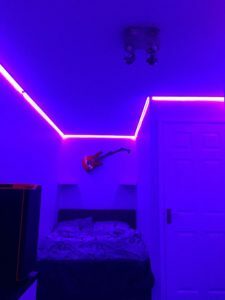 As outlined in Part 1, I elected to go for some super cheap LED strips imported from China. It took 3 attempts for the supplier to send the correct quantity of LEDs, at least the ebay seller was very good at listening and trying to correct their mistake. Once all 20m had arrived I started to test them out with the aluminium diffuser (Part 2a) to see how they’d look and quickly noticed some problems. When doing pure, White, Red, Green or Blue the strips looked great, but selecting other colour mixes showed some colour inconsistency. At first I thought I could just ignore it, but in large strips when their are dots of the wrong colour it became apparent that I’d need to do something about it. Looking at the LEDs more carefully I could see that for some LEDs the Red colour wasn’t as strong as others, even when doing pure Red. This became more apparent when mixing a bit of green or blue in, as the correct amount of red would be off. Below you can see the LED on the left is more green than orange. 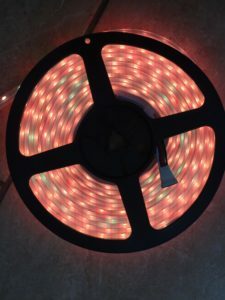 To see how bad things were I did an audit of all 25m (I purchased an extra 5m from another supplier to see if this was common) to look at how many of the 10cm sections had at least one bad LED, it was’t good, with an average of 44% being “bad”, though there was some significant variance between reels. the range was 30-60%. The reel from the alternative supplier was no better than any of the others. Knowing that I wasn’t going to have enough “good” LEDs to complete the project, I ordered another 15m from the original supplier. Whilst waiting for the additional LEDs to arrive I set about cutting out each section which had a bad LED and re-soldering the strip together to create good lengths of LEDs. 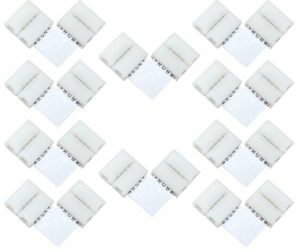 When the second order of LEDs arrive, the defective rate was similar to the first batch, I repeated the process of identifying “bad” sections and removing them. In the end I’m glad I did this as I think the defective LEDs would have ruined the project. The ~£50 the LED strips cost to get sufficient good ones still works out as a bargain compared to Hue light strips, though it doesn’t account for the time and frustration to fix them all up before installation. Referring back to the original plan I shared in Part 1, there are 2 zones which go around corners. Zone 2, the U shaped section around the bed and Zone 4 between the above the door and the left hand wall. In preparation for tackling the corners, I purchased some connectors which would clamp to the LED strip and provide a 90 degree corner hoping they would assist the installation process. However once the Aluminium profile arrived it became clear that the white plastic connectors were too wide to fit. 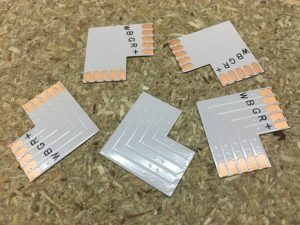 Removing the connectors from the L shaped flexible circuit, and trying to use it directly soldered to the LED strip showed that the pitch of the right angled connector was different to the LED strip making it impossible to join all the pads. 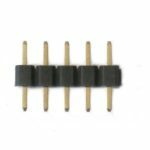 Luckily Amazon sell some 12mm L circuits with the correct pitch, but it did mean that the strips would need to soldered before installation. To further strengthen the corners I reinforced the L shaped pieces and the joins to the LED strips with some reinforced glass filament cross-weave packing tape. Putting up the aluminium profile was fairly straight forward, supplied with the kit were clear plastic clips for securing them with screws to the ceiling. I had initially considered using a 3M tape to secure the aluminium, but knowing that if I ever decided to remove it would leave long strips of damaged paint and potentially plaster. I elected to stick with the clips. I initially used 2 clips per meter placed within about 10cm from the end of the strip. However, I soon realised that I was able to achieve better alignment when joining strips by placing the mounting clips at the very end. So that the clip was supporting and joining two 1m sections. Corners were made using a hand mitre saw and all cuts were made with the diffuser in place, so that the diffuser and aluminium extrusion lengths would be the same. After each cut some minor deburring was required to clean up both the plastic and metal edges. I have wondered if offsetting the diffuser joins from the extrusion joins would have created a stronger join, but as I’ve not had any problems with what I did I’m not going to change it now. Installing the LED strip lights into the Aluminium profile should simply be a case of removing the backing tape from the lights and press fitting them into/onto the aluminium. If there is a right angle to deal with, then starting from the corner and working out is required. An extra pair of hands comes in helpful to try and keep the tape from getting tangled. An empty room would have helped too, but I wasn’t so fortunate. Problems arise when you have 2 right angles to deal with, as was my case in Zone 2. Problems can be compounded by the fact the strips can only be cut at 10cm interval. I thought I was OK until I attempted to install the lights and found I was 2-3mm short on the width between the two right angled pieces. To provide this small change in length I desoldered one of the RA connectors, and added a pin strip (like the one below) between the RA connector and the LED strip to provide the small increase in length. Had the distance between more than a few mm. I would have had to remove the right angle corner connectors and either used wire to connect the strips. 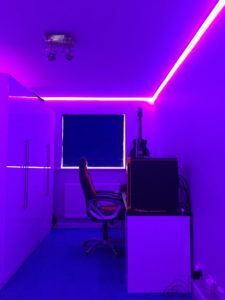 Another option would have been to avoid connecting corners within the profile at all, and instead running straight lengths and connecting each section to the relevant controller by drilling more holes in the ceiling and running up additional wires. The wall with the desk features two zones, Zone 1 above the desk and part of Zone 2 (bed area). 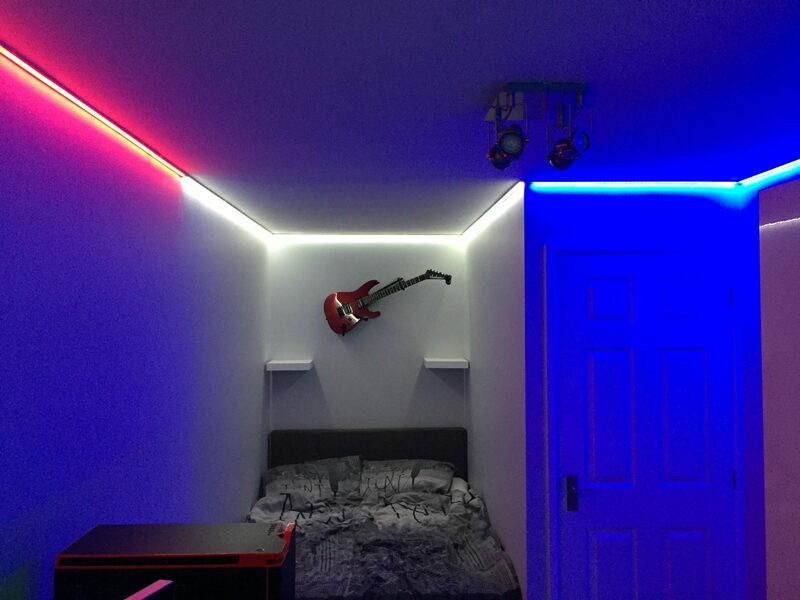 The goal was to create U shape around the bed which mean that the length of on wall with the desk was dictated by the length of the opposite wall. Given the 10cm cut restrictions this did result in a small gap between the Zone 1 and 2. I experimented a little but I couldn’t come up with a good way of avoiding this. The picture below shows the gap between Zone 1 and 2 on the left and Zone 2 and Zone 4 on the right. Though unless you’re looking at the ceiling you don’t notice this as the strips fill the room with colour. With the controllers installed in the loft above the room and powered from the distribution board above. It was simply a matter of soldering some 5 core cable to the ends of each strip which made up the zone, drilling a hole into the loft and passing the cable up to connect to the controller. The cable I sourced on eBay is a ribbon style cable helpfully colour coded for RGBW strips. 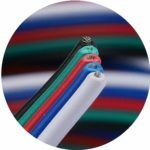 Keep in mind that the length between the strip and controller should be kept to a minimum to avoid voltage drops that will occur in longer lengths. Ok so you’d probably not want to have each zone a different colour. That was not really the intent, it’s mainly for effect here to show the zones. What I plan to do is be able to set scenes in the room, say for reading at night, or to have the bed zone come on early in the morning and slowly get brighter to help support the waking process. For fun I did create a script that changed the room different colours for each of the Microsoft Office apps, more as a proof of concept so that it could be adapted for when running different games, say Elite, make the room dark orange to match the cockpit lighting. More experimentation will no doubt follow. Some things didn’t quite go to plan which led to needing to investigate, take down, repair and re-affix some of the strips. There was also a small amount of soldering with the strips still attached to the ceiling, my gas powered soldering iron was invaluable here. Problem 1: Testing Zone 2 showed that one 10 section of the strip had lost the Blue channel during installation. These strips are fairly fragile but I don’t see any tears or obvious damage. Subsequent sections were fine so the Blue signal was passing through the section that was now faulty. What not to do (also known as, “what I did, and wish I hadn’t”): I tried to remove the U shaped section of zone 2 intact, without unsticking the LEDs from the aluminium. This resulted in extra weight/load being placed on the strip as I slowly detached the aluminium from ceiling clips. This extra load resulted in tearing of the corner L shaped pieces, and damage to the strips often near the joins in the aluminium where the LED strip would have been bent 90 degrees as each 1m section of aluminium was taken down. Net result, instead of one 10cm fault section I created 4 more broken sections and two broken corners. This did mean that when I repaired the strips I also added the extra reinforcing tape to the corners which was originally lacking in my first implementation. Solution: Carefully unstick the LEDs from the aluminium up to the faulty section. After unsticking the faulty section re-test, to confirm if the fault still exists, or if removing it from the aluminium has fixed it. If the problem is fixed, check any solder connections, also check rear of section for any damage or exposed contacts which may be touching the aluminium. Check solder connections to ensure they aren’t too large and potentially touching the sides of the aluminium when installed. If none of that works, remove the all connected LEDs and take them back to the work bench to cut out the faulty section and add a replacement. Do not try and cut out and re-solder the strips whilst still attached the the ceiling. Problem 2: Testing Zone 4 showed that nothing was working, despite having tested the strip before installation. Solution: Swap controllers to confirm if the problem is the controller or the light strip. 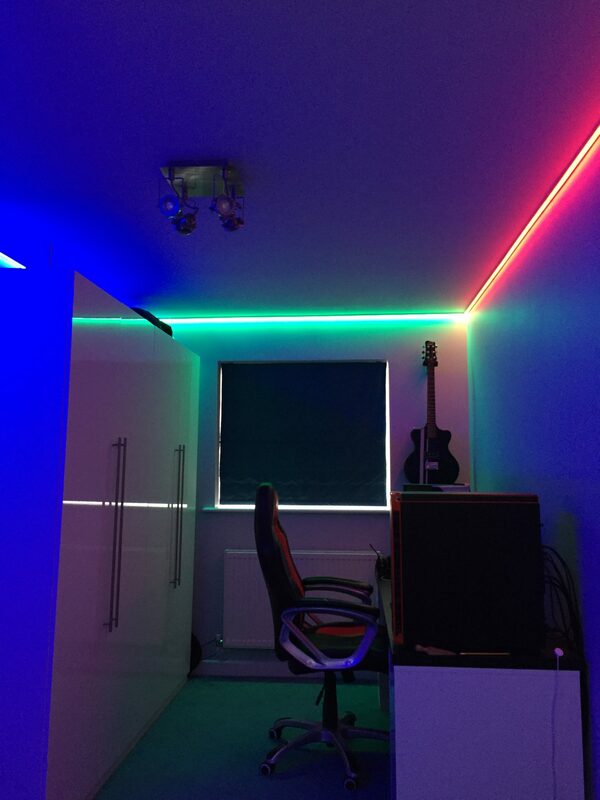 If the light strip then you probably need to take the strip down and look carefully at where the wires connect and any joins. If the controller doesn’t appear to be working (this was the problem I had). Remove power from the controller and leave for 10mins. Power back on and check with a multi-meter than when setting full red, green, blue or white that the correct voltage (~24 volts in my case) is present on each terminal of the controller. Reattach the cable to the LED lights, hopefully it’s now working. If not, check if voltage on controller is no longer the expected ~24v, indicating a fault being introduced between the controller and the lights. Investigate the connection and ensure nothing is shorting between the wires or to the aluminium strip. Problem 3: Controllers not found in Magic Home application after assigning DHCP reservations. Solution: After I assigned some DHCP reservations to the controllers, giving them different IPs than they had originally. 2 of the 4 disappeared from the Magic Home App, despite resetting the devices, trying to add them back the controller it didn’t seem to work. I’m unsure what was causing the problem but after a couple of hours it fixed itself. The next part of this series I plan to cover the integration with Home Assistant.